The Young and the Guest List: are you on it, or is it past your bedtime? Playwright and critic George Bernard Shaw once quipped, “Youth is wasted on the young.” More or less, this translates to “youth is a wonderful thing – what a crime, therefore, to waste it on mere children.” It’s what the neighbor yells at It’s A Wonderful Life’s timid Jimmy Stewart, who just can’t muster up the gumption to plant one on Donna Reed; it’s what Shaw himself likely muttered under his breath while penning Pygmalion, as visions of cold marble lying unresponsive to the touch mixed – like T.S. Eliot’s April – with memory and desire. Shoulda, woulda, coulda – but frankly, just too tired. The ultimate – to harness the vitality of youth and team it with the wisdom of an elder statesman – is rarely reached. When achieved, this marriage of will and wit is something to celebrate. WL’s Young & the Guest List returns with this end in mind. While some come from old money, all have the freshness and vigor of a ’30s Hollywood ingénue: they’re world-shakers, love-takers and all-around play-makers. We set the scene with a run-down of the year’s best under-40 events, the hottest bachelors and bachelorettes, top tracks (thanks to Deep Dish’s manager, Arash Shirazi, for dishing deep on his Ipod contents) and profiles of the “bright young things” who are making their way to the top ... in record time. Angela Valdez tracks the rocky road to success with an in-depth look at the social climber’s last resort – party-crashing. And, while Japanese Ambassador Ryozo Kato may not have made the age limit cut for the Y&GL, his youthful enthusiasm (check out that photo of him in full baseball uniform!) more than meets the mark in Executive Editor Michael Clement’s Embassy Row excursion. Often, the young are prone to faddism; however, keeping au courant can be a positive thing – check out our Trend Report, where yellow, blingy and slinky are the words to shop by … this month, at least. Just watch where you shop, as we hear the paparazzi have been hounding our young luminaries recently. We captured the commotion on Cady’s Alley in this month’s fashion feature – thanks to ’razzi royale Tim Coburn, stylists Lana Orloff and James Cornwell, and our wunderkind models Pamela Brown, Brooke Daley, Will Thomas, Grant Allen and Dominique Dawes. Thanks to Capital Dream Cars for the yellow Lamborghini we used as a getaway vehicle. Speaking of the young reaching extraordinary heights, we follow Katie Tarbox to the tippy-top of Mt. Kilimanjaro in our Travel section. We also explore adventures at sea-level;WL gets the details on the best nightclubs, restaurants, artists and events this month in Nightlife, The Dish, Paint the Town, and (of course) our Parties! Parties! Parties! pages, with February’s finger pressed firmly on the pulse of the under-40 set. While your average twenty- and thirty-something schlubs are still “monthto- monthing” it in Logan and Shaw, WL knows the truly forward-thinking young mogul is clued-in to real estate investments. These kids don’t rent; and if they do, you can be sure it’s their second address and it comes with a slip at the marina. What’s the latest in luxury location-scouting? 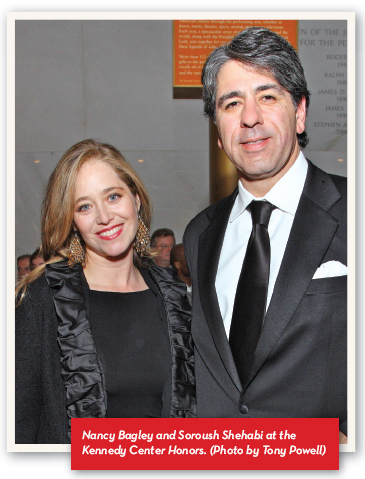 The real estate impresarios behind Washington Fine Properties dish in our Home Life section. We bring you a detailed look at the Kennedy Center Honors, as well as an exclusive excerpt of Michael Maccoby’s “The Leaders We Need,” coverage of Peter Jennings’ “A Reporter’s Life,” Oasis of Hope at the Embassy of Yemen, the Red Cross Kickoff at Bonnie McElveen Hunter’s residence and “Let Your Motto Be Resistance” at the National Portrait Gallery. We were also the proud sponsors of Fight Night, the WPAS Opening Night, the Corcoran 1869 Society’s Fall Fête, the Choral Arts Society Gala and the Starlight Starbright Children’s Foundation 1st Annual Wine Dinner. Looking ahead, mark your calendars for the March of Dimes Gourmet Gala and the Phillips Collection Gala, both in April.